You gave us a date for installation and kept your word. This is so important in business. We have found so many companies that give false promises and then do not deliver. Not so with Paver Mac. From the first time we phoned you until the installation was complete, you were honest, efficient, and highly competent. You gave us the opportunity to look at many of your work projects both completed and ongoing. 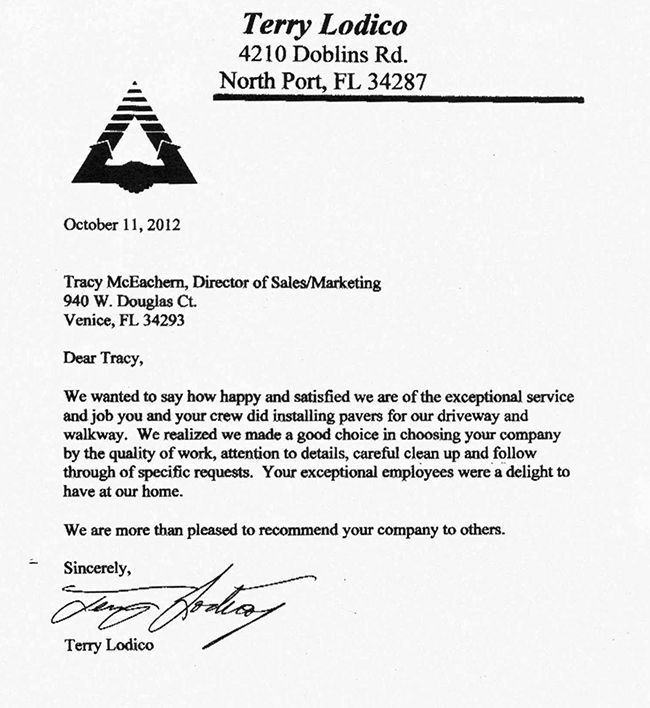 This was helpful in deciding what we wanted and illustrating your commitment to quality service and installation. You allowed us to pick our own pavers and gave us a set price for the entire job. There were no "hidden fees". Lastly, your work was extraordinary! It was more beautiful than I could have ever imagined. It was a superb job! Again, thanks to all of you for a wonderful job. Your company is what all companies should strive to do with customer service and commitment. "We have had the pleasure of working with Tracy and Alan multiple times on projects for us, including our pool deck, front fountain area and back ourdoor patio area. Every time, both have been highly professional and yet kind and honest -- all of which are rare traits in Florida, it seems. One of Alan's projects was to fix our driveway that had been done by a different company originally. Alan and his crew did a phenomenal job of fixing a mess they did not create, and we were so thankful. But the work they did from the beginning to the end was quality through and through and there has not been a need to fix anything. :-) If anyone is looking for pavers for anything, Paver Mac is *the only* company to call. We'll never call anyone else. Thank you, Alan and Tracy!" "My wife and I did some remodeling to our bedroom where we took out a window and put in a door. Al McEachern was the carpenter we hired to do the work. Al was dedicated to the job. He worked in a deliberate and practiced manner and in a short time had the work completely finished to our satisfaction. Thanks Al for a job well done."